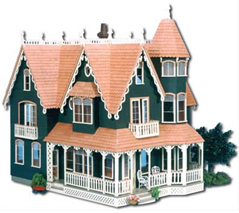 Amid all of the one-of-a-kind miniatures you will also find dollhouses. Gayle nicely displaysReal Good Toys Dollhouses in her store and on her website. Gayle says, “Only Real Good Toys in my shop! I feel I can put my reputation on their product.” She also mentions that Real Good Toys Dollhouses are the only dollhouses she has carried in her 16 years of being in business. Although you are not able to order directly from the website, she encourages you to call or fax your order. Gayle prefers to have a personal touch with each order.